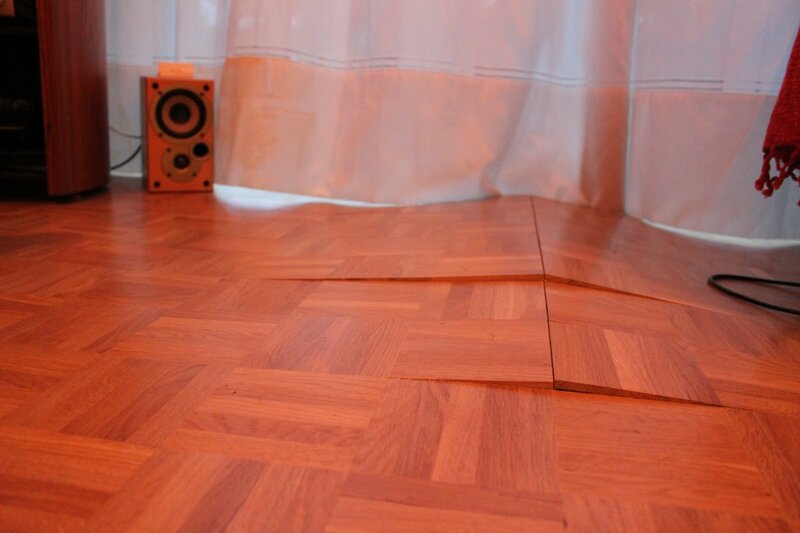 The wooden floor in the living room had started to lift around the middle of September 2013 (less than two months after the installation). I informed the Zurich Insurance on the 16th September 2013 by email. The living room got worse on Monday 23rd September 2013 and within a week the floor was lifted and broke into pieces. After many emails and phone calls to the insurance we managed to have another meeting with them and the contractors in order to evaluate the situation and hopefully take some action. That meeting took place on my flat on the 2nd October 2013. 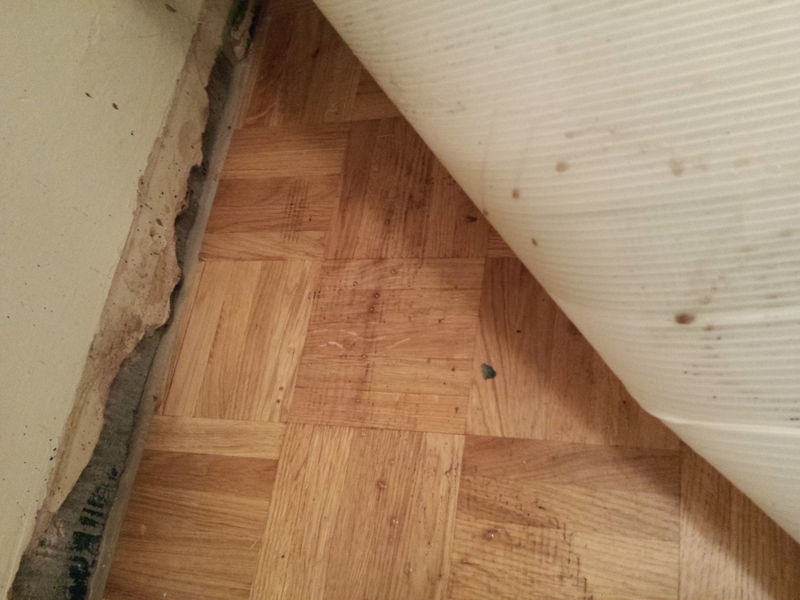 The loss adjuster, two of the floor contractors as well as the Project Director from Capital Services Ltd and an independent advisor came to my property. After 2.5 hours we agreed that they will have to find the cause of the problem and take some action. The same situation happened in the downstairs hallway. 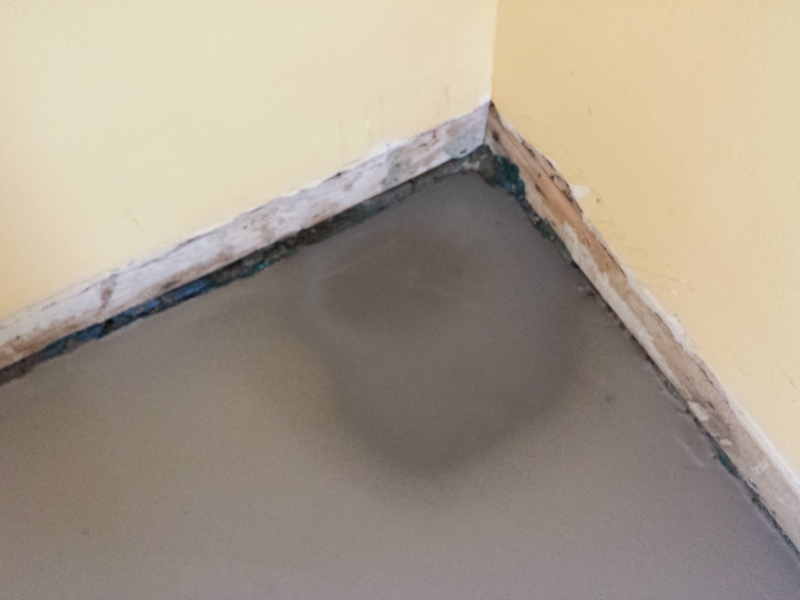 Finally the wooden floor in the small toilet downstairs is also wobbly but Capital Services Ltd and their subcontractors insist that it is ok! The situation on the hallway between the 02nd October 2013 and the 25th November 2013 can been seen on the right side picture. We have tripped many times to the wooden tiles but fortunately we did not have any injuries yet. However the above statement does not seem to be the whole story because as you can see from the picture below their workers did not remove the old adhesive. 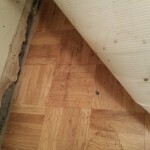 The top two images are showing the old adhesive which was present when the destroyed wooden floor was removed. 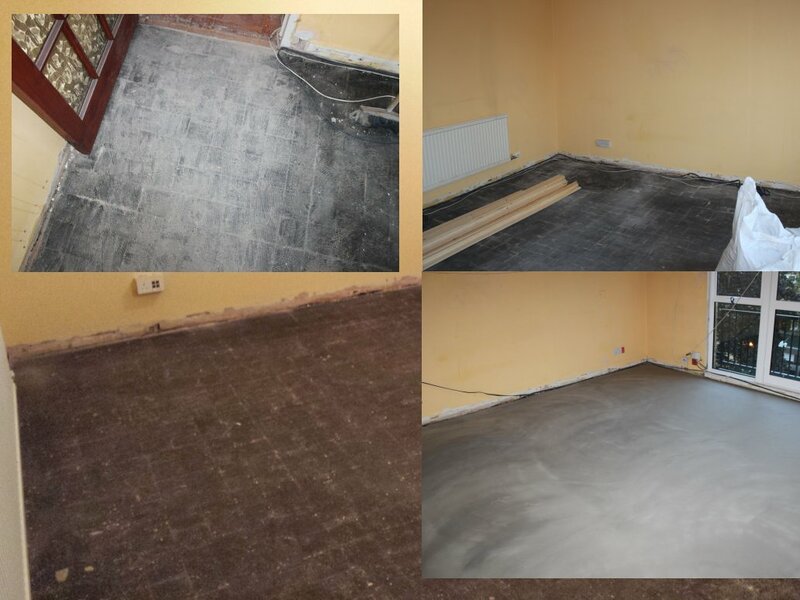 The photo on the right lower corner shows the new adhesive that the contractors used and the photo on the left lower corner shows the current situation as it was on November 2013. 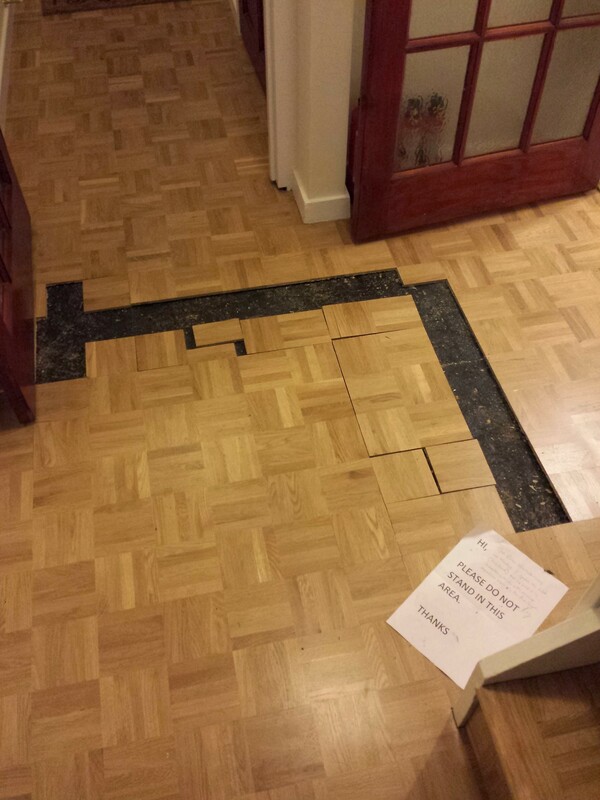 The black square marks on the floor are looking very familiar with the original marks. Also I cannot understand how those square marks could appeared on the black adhesive if the new parquet floor was installed above the grey coloured adhesive. The only logical explanation is that the contractors installed their grey adhesive on top of the old black adhesive and they hoped that everything would be ok. 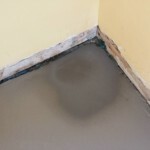 Since 30th November 2013, the floor installation has not been progress due to the wet living room floor as well as the leak on the toilet floor. At the same time there was condensation on living room, toilet and hallway. Zurich Insurance and GAB Robins told me that the wooden parquet floor could be installed on top of the wet floor which does not make any sense since the old floor was destroyed due to trap moisture. 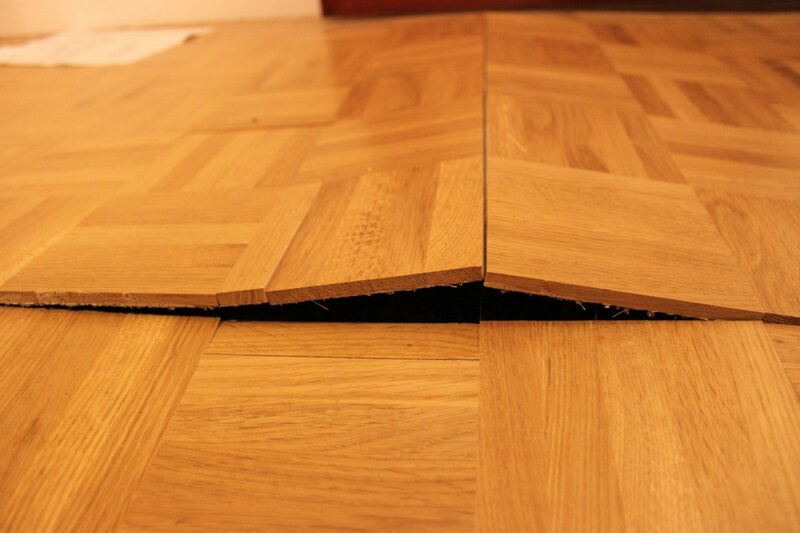 On 04th March 2014 the works for the floor was stopped because the floor specialists did not do the preparation works according to the manufacturer’s standards even if Mr P.M. stated the opposite of that. The floor preparation works will have to be done again for a fourth time. Read more here. On 31st March 2014, the Zurich Insurance’s sub-contractor managed to destroyed the wooden floor (less than 3 days after installation) inside the downstairs toilet. The area was full with water under the plastic protection sheets. They also damaged the first riser of my stairs. Read More.